Canyon Rust is one of the many new inks Monteverde is producing. It is a rich red/brown that definitely reminds me of canyons—Caprock Canyons in particular. I compared Canyon Rust with a few other browns in my ink collection. I expected it to be a close match to Diamine Ancient Copper, but the Diamine is much darker. Iroshizuku Tsukushi is more of a cool red/brown, Montblanc Toffee is a dark brown, and Kyo-Iro Moonlight, but is much lighter than Canyon Rust. I tested the ink with my Pelikan M600 Grand Place which has a medium italic nib. The ink flowed well and is quite wet on Maruman Septcouleur paper. In the medium italic, it showed some good shading, but no sheen (but see below). It is not waterproof. The chromatography shows that the ink contains pink, light orange, dark orange, and brown shades. I also tested the ink with my Handwritmic Pen. Boy, does a wide nib show off the shading and dark green/brown sheen of this ink. Monteverde’s inks claim to have lubricating properties (see more on that here). I’ve certainly not had any problems with their inks in my pens. If you’ve had trouble with Diamine Ancient Copper gooping up your nibs, you might give Monteverde Canyon Rust a try. You can get Monteverde Canyon Rust from JetPens, $8.00 for a 30ml bottle. 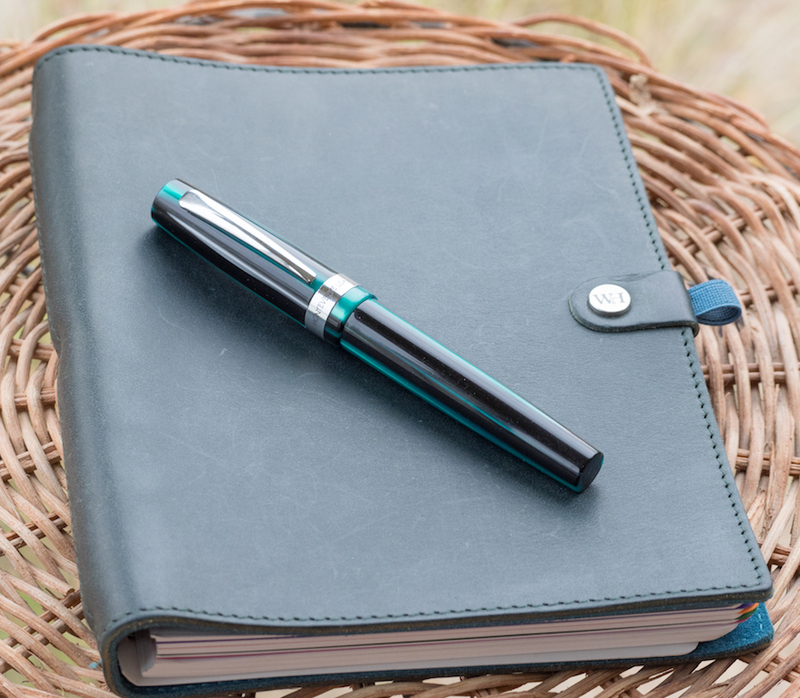 Posted on August 11, 2017 by Susan Pigott and filed under Monteverde, Ink Reviews. A few weeks back, I tried out my first Monteverde fountain pen ink and was pleasantly surprised. Since then, I've acquired another Monteverde ink, and while it doesn't perform as good as the previous, it's still a beautiful color and well-performing ink. Monteverde Emerald Green is a beautiful color, and I've really been enjoying using it as spring comes around. There are several blues that easily make my top 5 lists, and I don't even need much time to decide. Greens, however, are a bit more elusive for me. I haven't settled on a list of favorites because I'm still working on finding what I like, and it doesn't help that there are an endless amount of green inks out there. It's slow work, but it's enjoyable. Emerald Green takes its name from the emerald jewel, and it lives up to that name quite well. It's not what I would call a true emerald green, but it gets close and manages to be beautiful in the process. At the end of the day, I'm less interested in the name of the ink compared to how I like the color and ink properties. Emerald Green is a light to medium green hue depending on how much ink is on the page. At times, you can detect more yellow and a touch of blue, giving it a pleasant teal or lime hint. Even with these other tones, it's impossible to mistake this for another color. It's absolutely green, and it's a beautiful shade. Just like the Scotch Brown ink I reviewed, this ink has Monteverde's ITF (Ink Treatment Formula) that supposedly makes it perform at a higher level. Thinks like easy and consistent flow, resistance to drying when the cap is off, nib lubrication, and dry times. Like I said in my earlier review, I don't know (or really care) about their treatment system; whatever they're doing seems to work just fine. This is a very well-behaved ink. It flows well in the pens I've used, it doesn't have any trouble with starting or skipping, even after being uncapped and unused for a minute. It also does really well after being capped and unused for over a week — the ink usually started flowing just fine after the first stroke of a letter. Impressive. The dry time is also a positive aspect of this ink. I found that the ink was dry on the page within 10-15 seconds in most cases. Obviously, this time increases as the nib size increases, but it manages to dry quickly in general. Shading is great with this ink, though I wish it had just a little bit more variation. When you look at the ink after it dries, it's easy to see the shading between the fast and slow strokes of the letters and where the ink pools. But, the shading doesn't occur as effortlessly as other favorite inks. Still, it's nothing to criticize — it does a great job shading. One thing I did notice was that the ink had significant show-through on some papers. Specifically, the untreated Baron Fig paper suffered the most, and also exhibited a good amount of feathering. But, on coated papers (Rhodia, Clairefontaine, Apica), it showed through very little and had no feathering problems. Sure, some inks perform well on every paper you throw at it, but this Monteverde still does a very good job considering. Part of using fountain pens is understanding that each pen, ink, and paper combination are unique and require a bit of learning to find what suits it best. 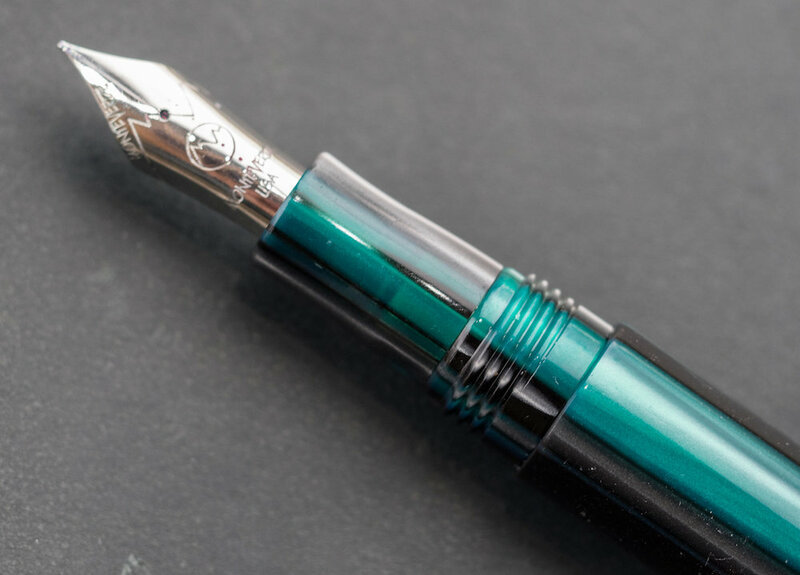 Overall, I've really been enjoying the Monteverde Emerald Green. It's a pretty good deal on JetPens at about $8 for a 30ml bottle. If you really love this ink, you can also purchase it in a massive 90ml bottle for just $16. If you're looking for a new green to try, consider this one! Posted on April 19, 2017 by Jeff Abbott and filed under Monteverde, Ink Reviews.